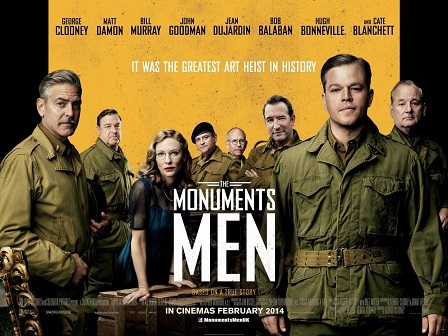 “The Monuments Men” – An Apologetic of Culture | J.W. Wartick -"Always Have a Reason"
“The Monuments Men” is a film based on a true story of a group of soldiers sent to salvage cultural artifacts from destruction by the Nazis. Here, we’ll analyze the film from a worldview perspective. There will be SPOILERS in what follows. The question is put in a number of poignant ways, such as a moving scene in which Donald Jeffries is killed in an effort to protect Michelangelo’s Madonna and Child. The scene is powerful because Jeffries finds his value in his efforts to defend and preserve this beautiful art. He writes a letter to his father about the value of defense of such a work of art, which is overlaid with the imagery of him being killed by a Nazi officer. Claire Simone works against the Nazis to try to protect and preserve the ownership of art. Her recognition of the importance of these pieces of history to those who collected them is a recognition of the power of the human mind to transcend the mundane. The power of art to shape humanity, or even become a monument to humans–a way to transcend–is front and center throughout the film. The question that is then begged is this: if the natural world is all which exists, whence the transcendence? Where or to what might the transcendence point? History is important aspect of human life. Long have various cultures held notions that if one’s name were erased from historical record, it was as if one never had existed. The driving force to be remembered is a powerful one in human life, but perhaps it is also something which drives us towards art. By collecting the art and stealing the works from their rightful owners, the Nazis were essentially attempting to rewrite history and capture the cultural past of those who owned or produced the art. There is a powerful message behind this of the need to be aware of how history is shaped by even those who are writing it. How is it that humans recognize the value of art, or, more abstractly, of beauty? Some would allege that it is merely something we assign to things. The value is entirely a construct. In some ways that seems true, but there is something inherent in the notion that beauty–that art–is something which it is a great evil to destroy or take from someone else. Beauty is in the eye of the beholder, but it is also something which points beyond itself, to the transcendent. The very possibility for recognizing that which is beautiful itself cries out for explanation. Whence the need for, dedication to, and recognition of beauty? A Christian would point beyond these towards God. Without the actual existence of the transcendent, there is little possibility for explaining the capacity for humans to reach out and grasp it. “The Monuments Men” is a very solid flick to explore from worldview perspectives. It’s not as action-packed as most war movies, but it is more thoughtful and because of that it is in many ways more compelling. Perhaps most interestingly, it offers a view of the arts as something concrete, to be appreciated, and perhaps even transcendent. I was going to skip this movie and now I have to see it. THANKS! I hope you enjoy it if you do watch! Good review J.W. The movie could have definitely been better, but I think with the cast involved, you couldn’t really have a bad time. And I didn’t! I agree–as a movie it could have been better, but I enjoyed it well enough and really enjoyed the worldview issues it brought up.